With your two hands, give someone special your heart and crown it with your loyalty. Claddagh rings are a beautiful symbol of love and affection for another. This unique ring originated in the ancient village of The Claddagh in Galway, Ireland and has become famous worldwide for the sentiment that it conveys, as well as for its unique appearance. The tradition of a mother gifting the ring to her daughter still lives on, but has also been expanded, and today, this ring is used as a friendship ring, a promise ring and the motif has even been incorporated into wedding bands. That is why we say that the Claddagh is the perfect ring to show a friend, a partner or a family member just how you feel. Since the launch of our first website in 1996, Claddagh Jewellers have made and shipped thousands of Claddagh rings all over the world. 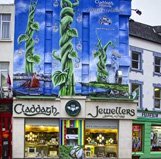 Our shop is based in the heart of Galway City, Ireland as is our workshop, where each ring is expertly crafted. "A ring comprised of a crowned heart, held between a pair of hands, that is designed and made from start to finish, within the old City walls of Galway, with the date of manufacture recorded in a central register, which is independently verified." Our beautiful and diverse collection will leave you spoilt for choice. Regardless of the type of ring you are searching for, your peace of mind is our number one concern. The Authentic Claddagh ring™ is available in a range of materials, so we have something to suit everyone's taste and budget. We make the traditionally styled Claddagh, in sterling silver, gold or platinum. Our range of gold Claddagh rings starts at 9kt yellow gold, 9kt white gold or 9kt rose gold and is cast in a selection of three weights. If you are looking for 14kt gold Claddagh rings, you can also choose from yellow gold, rose gold or white gold. Our top of the line 18kt gold Claddagh rings are available in either white gold or yellow gold and for that extra special gift choose a sturdy and lustrous Claddagh ring crafted in platinum. If that wasn't enough, check out our range of faux gemstone Claddagh rings available in a wide variety of colours and styles.